This open loft floor plan is superb - design the space any way it works for you! This penthouse loft has a great open layout but is completely practical too! You will love the flow of the living, dining and kitchen areas just as true loft living should be, but you also get an incredible separate bedroom partitioned by a sleek wall of glass, providing privacy without taking away from the open loft feel. The whole space is bright and cheerful thanks to the stunning skylight and the wall to wall windows. Bamboo floors shine and the contemporary stainless kitchen is any chef’s dream. All the best Bosch appliances, gas cooking and terrific cabinet space are all fabulously featured in this kitchen. With sweeping park views, in-loft laundry, air-conditioning and two car garage parking, all the best amenities make this home simply superb! 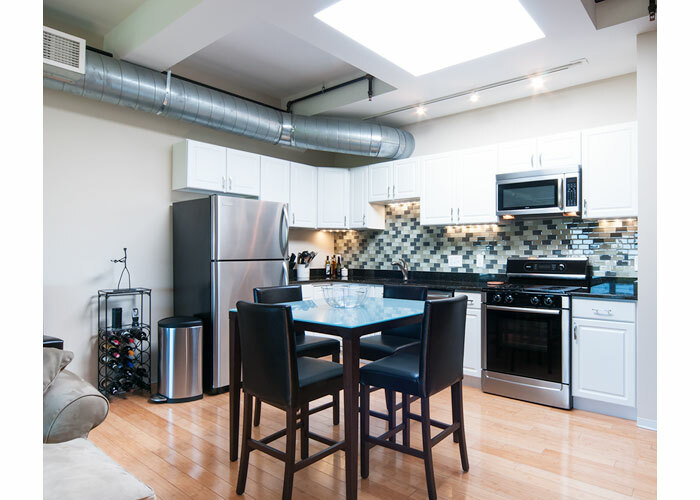 On site management, a wonderful common roof deck, and roof top entertainment room are excellent building perks and this neighborhood just gets better and better as East Boston hits the real estate map! Already convenient and so easy to Downtown, Porter 156 is already a great place to call home….but East Boston is just beginning to develop and the Waterfront will bring even more excitement to this well kept secret where you get so much more for your money – hurry this investment opportunity will not last long!